Calif. Gov. Jerry Brown yesterday, after about a month’s wait, vetoed Senate Bill 649 that would have removed local control over cellphone tower creation. It would have created a state mandated system of cell towers every couple of hundred feet apart in California, said opponents. Opposing it were 300 cities, 47 counties and more than 100 community, planning, health, environment and justice organizations. EMF Safety Network and Ecological Options Network opposed SB 649 since the bill was introduced in March because it said cell towers emit harmful radiation. The bill would have allowed unlimited refrigerator-size cell equipment on utility poles, streetlights, sidewalks, in parks, on schools and public buildings with no safety oversight. Gov. Brown said local communities should have a say in placement of any such towers. The bill was primarily supported by the Cellular Telecommunications and Internet Association, the main trade group for the U.S. wireless telecommunications industry. The group said SB 649 would help boost the economy. Yet the bill had alarmed many local government officials around the state. They worried if SB 649 became law, it would cap how much they could charge phone companies for leases to $250 a year. Activists, meanwhile, were concerned about the risk to public health from cell towers. 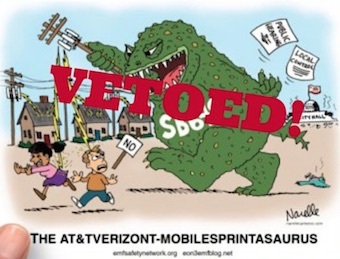 “I am thrilled that Governor Brown showed strength and stood up to this powerful wireless industry and said no — you are not going to do this in my state!” Ellen Marks, a San Francisco-based leader of the California Alliance for Safer Technology, wrote in an email after Brown’s decision was posted online. “This is a tremendous victory for democracy,” said Marks, whose group is trying to keep cellular antennas away from homes, schools, offices and parks. A CTIA spokeswoman said the bill maintained local authority for “small cell” antennas, particularly in historical or coastal areas, and that governments could recover capital and administrative costs. But San Jose Mayor Sam Liccardo was among several Bay Area leaders who voiced their opposition to the bill, and he did so again in an Oct. 3 opinion piece published in the New York Times. In it, Liccardo argued that if enacted into law, SB 649 would override local authority to set lease rates, supplant local jurisdiction rights to decide how to deploy telecommunications equipment over public areas, and wouldn’t require those companies to expand broadband access to low-income neighborhoods. Grass-roots activists and scientists said that if SB 649 became law, a projected 50,000 new cellular antennas would be installed on public buildings and utility poles in California neighborhoods, creating a risk to public health because of the dangers of radiation and electromagnetic frequencies emitted by cell towers. Quirk and Hueso called that criticism by scientists of their legislation overblown, saying the cell towers are safe. Yet repeated calls this summer by the Bay Area News Group to the Washington, D.C.-based CTIA seeking comment on potential health concerns related to cellular antennas were never returned by any spokesperson. At the time, Joel Moskowitz, director of the Center for Family and Community Health at UC Berkeley’s School of Public Health, told the Bay Area New Group that the trade group habitually ducks publicly addressing the health risks of cell antennas. The CTIA “never says it’s safe because the industry will be in deep water when the lawsuits play out finally before a jury,’’ said Moskowitz, who has studied and written about the issue for eight years. In an email to the Bay Area News Group late Sunday, Moskowitz was heartened by Brown’s veto, coming on the heels of a federal appeals court ruling last week that supports Berkeley’s landmark cell phone “right to know” ordinance. The city law, which took effect last year, requires retailers to warn cellphone customers that wearing their device next to the body could result in exposure to radio frequency radiation exceeding federal guidelines. “The Governor’s veto of SB 649 protects Californians from exposure to millimeter radiation from as many as 50,000 new cell towers,” wrote Moskowitz.